I probably should clean this code up and release a QTestlib Reports tool. Later on…. By the end of this week, I hope to stop working on the “Engine” part. So next week I can actually fix the Maliit plugin to make it ready for an alpha build. Since it was quite.. uncomfortable to swipe such long trails on my laptop screen, this is Part I of the larger screen improvements coming to Skeyer. 1) Easily write automated tests to benchmark the performance and precision of Skeyer’s algorithm(s): I’ve realized I need a more objective way to measure the performance and precision of Skeyer than to manually swipe a few words and look at the suggestions and make a wild guess if it is good or not. 2) I have also started writing a Maliit plugin for Skeyer(based on the examples from Maliit-framework): I’ve realized it is important to build the maliit plugin first. That way, I’ll have better idea of constraints on Skeyer, based on my usage of it on a real device. And of course to easily show off Skeyer to everyone. A real world application seems to be much more…. interesting… than a tech demo. 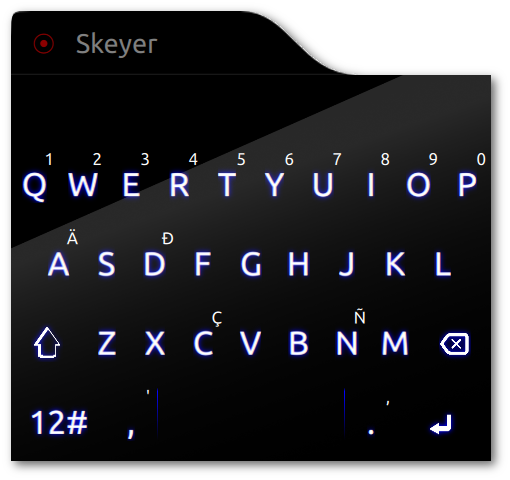 I have also started looking at implementing a very interesting new feature for Skeyer, based on the way I’ve been using my Nokia N9 lately (Yup. No other phone seems to beat the N9 experience for me so far). I think this feature will make Skeyer a lot more useful. But I need to really build this feature first to test it’s worth. So I will talk more about this once I have something to show(off? 🙂 ). 1) Finish off the maliit plugin (and dig more into the Ubuntu touch/Open WebOS virtual keyboard). 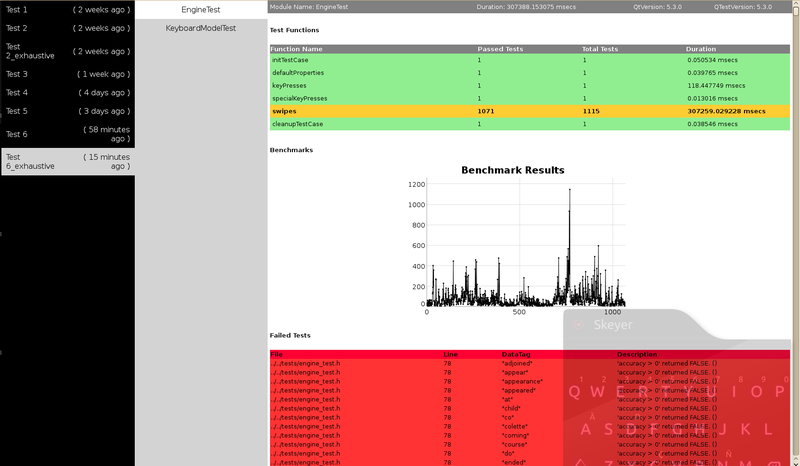 2) Write the tests/automated benchmarks. 2) Cleaned up the Keyboard file format. I think I need to do this once more. 3) Experimented with a few more custom dictionaries generated from stardict dictionaries. The prediction performance is now satisfactory. 4) Slight improvements to the word prediction algorithm based on the perplexity. The prediction precision in general has improved quite a lot, except in the case of short words for which you have to swipe a long track (like “tfdsasdfghjijnbhgt” -> “taint”) where it is now abysmal. 5) The facelift for the UI has started. Something tells me this will be a lot trickier to get right though. 1) Implement the long press and extended keypress popup functionality for the keys. 2) Annoy Maliit folks to help me compile the Maliit plugin. (Update: DONE. Thanks to bfederau, I got to compile and run Maliit on my desktop.) – Now time to develop the Maliit plugin. 3) Fix the annoyances with the Prediction functionality. 4) Implement the state machine to take care of actual text input.